Amazon has started offering a service for schools and enterprises that are looking for a way to easily send out e-books to a large number of Kindles. The free service is being called “Whispercast for Kindle,” which is in line with the branding that Amazon has already introduced for other services that sync data across multiple devices. Whispercast will allow teachers to manage Kindles from a central online location to set up policies, including things like blocking Facebook or Web browsing, and to prevent purchasing anything in the store. Teachers will also be able to push content down from the store. For enterprises, they can push down settings that require employees to have a password, or add personal devices owned by employees to the network. Jay Marine, VP of Kindle at Amazon, said in an interview that lots of schools have been testing Kindle devices in the classroom, and while teachers generally liked them, there were also a lot of challenges when it came to administering and managing the devices across multiple classrooms and grades. “We worked with them on this, and got a lot of feedback. It’s been overwhelmingly positive,” he said. Whispercast will work on everything from the company’s lowest-end e-reader to its most expensive color-screen tablet. It will also work across any device running the company’s free Kindle application, including iOS and Android devices. In the coming months, Amazon hopes to expand the service to support the distribution of Kindle Fire applications. Of course, if Amazon can create tools that make it easy for large organizations to buy Kindles, it may result in more sales of the devices and content — so all this good work will eventually pay off. In a release, Amazon says that Clearwater High School started off using 2,000 Kindles two and a half years ago, and now is using them in 122 schools in the district. 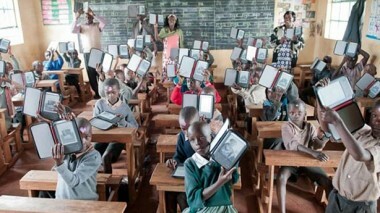 Separately, a nonprofit organization called Worldreader was one of the first to try out the technology, and is now using Whispercast to wirelessly deliver more than 200,000 e-books to children in sub-Saharan Africa, as part of the literacy program.